Lung cancer is an abnormal growth of cells in the lungs, usually caused by smoking cigarettes, that frequently spreads to other parts of the body and often is fatal. In the 1960s, actor David McLean was hired to portray the Marlboro Man, a macho, cigarette-smoking cowboy, in television and print advertising for the tobacco company Philip Morris. McLean smoked many packs of cigarettes to get the right, ruggedly handsome look for each ad, and later he continued to receive boxes of cigarettes as gifts from the company. McLean had begun smoking at age 12, and he never was able to quit. In 1985, he began to suffer from a lung condition called emphysema * due to smoking, and in 1993, he was diagnosed with cancer of the right lung. By 1995, the cancer had spread to his brain and spine. McLean died that year at age 73. The lungs allow people to breathe by bringing air in and out. They take in oxygen and get rid of carbon dioxide, a gas that is a waste product of the body. The lungs are two sponge-like organs in the chest. The right lung has three sections, called lobes, and the left lung has two. A lining, called the pleura (PLOOR-a), surrounds the lungs and helps protect them. Air travels into the lungs through the trachea (TRAY-kee-a) (also called the windpipe), which divides into two tubes called bronchi (BRONK-eye), which in turn divide into small branches called bronchi-oles (BRON-kee-oles). At the distant tips of these branches are millions of tiny air sacs called alveoli (al-VEE-o-lye), which look like little buds. These structures together make up the lungs. How Does Lung Cancef Start? Lung cancer usually starts in the lining of the bronchi. However, it can begin in any other part of the lungs. The disease takes a long time to develop. Lung tissue, like other kinds of body tissue, contains DNA. This is material that people get from their parents that contains the instructions, or genes * , for everything the cells do. Gene changes, called mutations, can cause normal cells in the lungs to do abnormal things and to form cancers. Some genes tell cells when to grow, and others tell them when to stop growing. Mutations in these genes may tell cells to grow too much, or they may fail to tell them to stop growing. In either case, the result is cells that are out of control. The cells have repair mechanisms to correct the faulty signals, but when a cell is growing very fast, errors may slip past. * emphysema (em-fi-ZEE-ma) is a lung condition in which the air sacs of the lungs are enlarged, which makes the lungs work less well and leads to shortness of breath. Most of the mutations that occur in lung cancer are not believed to be changes that are inherited from a person's parents. Instead, the mutations seem to occur during the person's lifetime. However, it is possible for a person to inherit a reduced ability to break down certain kinds of cancer-causing chemicals. Scientists cannot tell yet which people have these reduced abilities. Anatomy of the respiratory system. In the United States, more men and women die from lung cancer than from any other kind of cancer. The American Cancer Society estimates that, every year in the United States, about 178,000 people will find out that they have lung cancer, and more than 160,000 people will die from the disease. Lung cancer is rare in people under age 40, because it takes years to develop. The number of cases increases with age, particularly after age 65. Up to 90 percent of lung cancer is caused by smoking. Tobacco smoke damages cells in the lungs of smokers in ways that can lead to cancer. Although most smokers do not get lung cancer, the longer a person has been smoking, the greater the risk. People who have worked with asbestos, a substance once widely used as an insulating material that is now banned in the workplace and in home products, also have a higher risk of getting lung cancer. Other risk factors * for the disease indude cancer-causing chemicals in the workplace. * risk factors are anything that Increases the chance of developing a disease. * sputum (SPYOO-tum) Is mucus that Is coughed up from the lungs. What Happens When People Have Lung Cancer? Symptoms of lung cancer often do not appear until the disease is advanced. Many times, the cancer is discovered when a person gets a chest x-ray for an unrelated reason. When symptoms do occur, they are so general that many conditions could cause them. Possible symptoms include a cough that does not go away, chest pain, hoarseness, bloody sputum * , and shortness of breath. The only way to find out for sure whether cancer is causing these symptoms is to see a doctor. 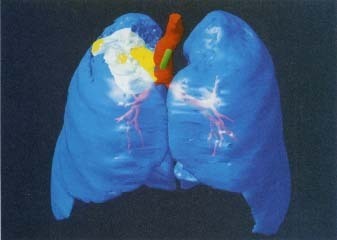 This color-enhanced CT scan shows what lung cancer looks like inside the body. Healthy lung tissue is shown in blue, and the major air passages are in red. The cancerous lung tumor is yellow, and the green rod is the tube (endoscope) that the doctor uses to view the tumor and to plan surgery to remove it. Volker SteeSiem, Science Photo LibraT/Photo Reseanhers, Inc. If lung cancer is suspected, the doctor may perform a physical exam and a chest x-ray. The doctor also may take a sample of sputum to be examined for abnormal or cancerous cells. In addition, if a tumor * is found on the x-ray, the doctor can do a biopsy * of the lung tissue. This procedure uses special instruments to remove a small sample of abnormal tissue from the lung for examination under a microscope. First tests are done to find out how far the cancer has spread. Based on these tests, the cancer usually is assigned a Roman numeral from I to IV. This process is called staging. The smaller the number, the less the cancer has spread. In contrast, a stage IV cancer means a more serious stage of the disease. This system is used for most types of lung cancer, including the types called squamous cell cancer, large cell cancer, and adenocarcinoma. One-fourth of lung cancers are a type called small cell lung cancer. Instead of getting a Roman numeral, this type is rated either limited (not widespread) or extensive (in both lungs, for example, and spread to distant organs). The best treatment for lung cancer depends on the type of cancer, the stage, and the person's overall health. Treatment usually consists of a combination of surgery, chemotherapy (kee-mo-THER-a-pee), and radiation therapy. For cancer that has not spread, surgery offers the chance of a cure by removing the diseased part of the lung. However, some tumors can not be removed by surgery because of their size or location, and some patients can not have surgery for other health reasons. Chemotherapy is the use of anticancer drugs to kill cancer cells. The drugs are given into a vein in the arm or as pills. Because these drugs enter the bloodstream and can reach all areas of the body, they may be useful for treating cancer that has spread beyond the lungs. Chemotherapy can have side effects, including nausea (a feeling of wanting to throw up) and hair loss. Not everyone reacts to chemo-therapy in the same way. Usually, the side effects disappear and hair begins to grow back when the treatment is over. Radiation therapy is the use of high-energy x-rays to kill or shrink a tumor. In lung cancer patients who are not healthy enough for surgery, radiation may be the main treatment. For other patients, radiation may be used after surgery to kill small areas of cancer cells too tiny to be seen during surgery. Radiation can make a person feel tired, and the skin in the treated area may look first sunburned, then tan. The skin eventually will return to normal. * tumor (TOO-mer) usually refers to an abnormal growth of body tissue. Some tumors are cancerous, but others are not. * biopsy (BY-op-see) is the removal and examination of a sample of tissue from a living body for the purpose of diagnosis. For a long time, cigarette advertising on billboards was a familiar feature of the American landscape. One of the most famous signs was a 72-foot-high billboard in New York's Times Square that showed Joe Camel puffing out smoke rings for 25 years. During the 1980s, one in three billboards advertised tobacco. However, in 1999, as part of a $206 billion agreement between tobacco producers and 46 states to settle lawsuits related to smoking, cigarette makers and outdoor advertising companies removed tobacco billboards all over the United States. The best way to prevent lung cancer is by not smoking. People who do not smoke should not start, and people who do smoke should quit. Because the nicotine in cigarettes is so addicting, it is not easy to quit, but it is well worth the effort. Simply switching to "low tar" or filtered cigarettes does not prevent cancer. Everyone also should avoid breathing in other people's smoke. In addition, people can find out whether cancer-causing chemicals are used in their workplace and take steps to protect themselves. Right now, prevention seems to offer the greatest chance for fighting lung cancer. Research is continuing into ways to prevent lung cancer in people at high risk by using vitamins, foods, and medications, but the results so far have not been very helpful. Researchers also are looking into ways of detecting lung cancer earlier. Studies of treatments for lung cancer are looking at new chemotherapy drugs or new combinations of old drugs. Treatments that help the patient's immune system * fight lung cancer more effectively also are being tested. In addition, gene therapy * may one day be able to repair the genetic mutations that lead to lung cancer. Some people recover from lung cancer, but even in the least severe cases, only 50 percent of people with lung cancer are alive five years after their diagnosis. When all cases of lung cancer are taken together, including both most severe and least severe cases, the survival rate at five years drops to 14 percent. This is one reason that it is so important not to start smoking or to quit if a person does smoke. Because of the low rate of cure, lung cancer patients typically have concerns about whether the cancer will come back after treatment and how long they will live. People need their lungs to breathe, so in advanced cases, as the cancer takes up more and more of the space usually occupied by air, breathing may become difficult. In addition, growth of the cancer around certain nerves may cause severe pain. Medications can relieve this pain, and patients should not hesitate to ask for them. * immune system is the body system made up of organs and cells that defend the body against infection or disease. * gone therapy is a treatment that works by altering genes. A study published in the Journal of the National Cancer Institute in 1999 showed that lung cancer patients who had started smoking before age 15 had twice as many DNA changes in their lung tissue as those who started after age 20. The message from this study is that smoking at a very young age may be especially likely to cause lung damage that lasts a lifetime. American Cancer Society, 1599 Clifton Road Northeast, Atlanta, GA 30329-4251. A national, nonprofit organization that provides accurate, up-to-date information about lung cancer. American Lung Association, 1740 Broadway, New York, NY 10019. Another large, nonprofit organization that provides detailed information about lung cancer. U.S. National Cancer Institute, Building 31, Room 10A03, 31 Center Drive, Bethesda, MD 20892-2580. This U.S. government agency offers information about lung cancer to patients and the public, and a posts a fact sheet What You Need to Know About Lung Cancer at its website.